Our first ELK Studio – From the Heart event is almost complete. Wendy has received everyone’s projects and can now send them to the Crochet for Cancer the San Francisco Chapter. We had 10 women give 30 projects this month!! I think that deserves a Woo Hoo! Here’s a great photo taken from Wendy displaying our work! What an amazing feeling to see total strangers selflessly come together for the greater good. I may not have talked to Jennifer, Wendy, Maria, Elena, Elizabeth, Liz, Arlette, Ashley or Ash on the phone, and I don’t know much about them personally but here’s what I do know…… I shared something on my heart to these women, and they wanted to help me. I’ve watched them over the last month discuss this event and really support one another. This mission ran like a well oiled machine with not one single hiccup and it’s because of my crocheting sisters. I can count on them for great advice, moral support and friendship. 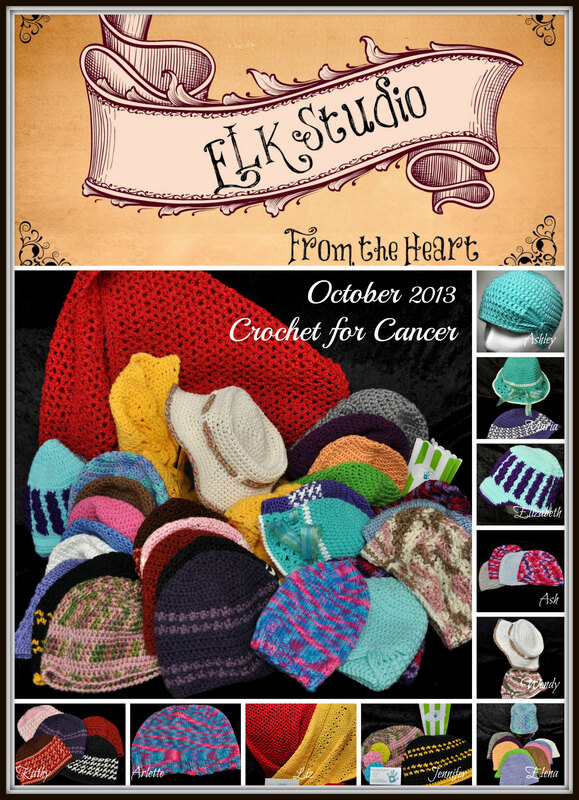 If you’re interested in learning more about ELK Studio – From the Heart, you can email me at elkstudiocrochet@gmail.com or join ELK Studio Crocheters group. Kathy a wonderful post. Kathy than you for your generosity of heart to dream of this crochet. And thanks to Wendy for organizing for October. This really is a nice group. Thank you for putting this together so we could serve others! It’s wonderful to see! It is wonderful to see! Thanks for helping! Certainly couldn’t have done this without YOU, Dear Kathy! I was overwhelmed yesterday unwrapping all of the lovelies and taking the photos – made my heart sing with every single item. With love and overwhelming generosity – we all came together to give to another – AWESOME! It’s certainly been wonderful to see it come together! We Sooooo love you Kathy! This is a great idea with great women!